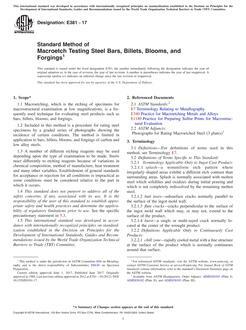 1.1 Macroetching, which is the etching of specimens for macrostructural examination at low magnifications, is a frequently used technique for evaluating steel products such as bars, billets, blooms, and forgings. 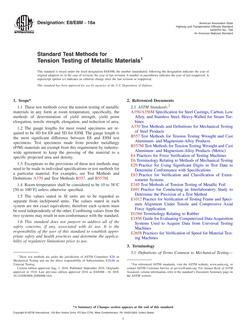 1.2 Included in this method is a procedure for rating steel specimens by a graded series of photographs showing the incidence of certain conditions. The method is limited in application to bars, billets, blooms, and forgings of carbon and low alloy steels. 1.3 A number of different etching reagents may be used depending upon the type of examination to be made. Steels react differently to etching reagents because of variations in chemical composition, method of manufacture, heat treatment and many other variables. Establishment of general standards for acceptance or rejection for all conditions is impractical as some conditions must be considered relative to the part in which it occurs. 1.4 This standard does not purport to address all of the safety concerns, if any, associated with its use. It is the responsibility of the user of this standard to establish appropriate safety and health practices and determine the applicability of regulatory limitations prior to use. See the specific precautionary statement in 5.3.